I've updated this very popular article a little bit and pushed it up from the archives, since it is the season for cold noodles now. I'll also have a followup recipe soon for the perfect accompaniment to zaru soba. Originally published in May 2007. Most of Japan gets very hot and humid in the summer. To combat the heat, a number of dishes meant to be eaten cold have been developed. One of the main cold summer dishes is cold noodles. Soba noodles, made of soba (buckwheat), are available all year round but are really popular when the heat turns unbearable. As with other cold noodles, they are prepared in a way that may seem strange if you're used to pasta and other Western-style noodles. Unlike pasta, most Japanese noodles, including soba, are rinsed rather vigorously in cold running water. This not only cools them down but gets rid of excess starch, which adversely affects the flavor of the noodles. Many recipes written in English omit this critical rinsing step: you don't just plunge it in cold water, as many directions incorrectly state, but you actively wash the noodles. Once you've done this once, you will definitely notice the difference. I've given detailed instructions for this procedure below. Dipped into a properly made sauce or soba tsuyu, with plenty of spicy condiments or yakumi, there's nothing more refreshing to eat on a hot summer evening. Note: zaru means basket - so these are soba served in a basket. Combine the two in a pan and bring up to a simmer. The less dashi you add the more intense the sauce will be, so add the dashi a little at a time, and start tasting after you've added about 1 1/2 cups: keep adding if it's too strong. Simmer for 2-3 minutes, then let cool. You can do this a day ahead of time, and refrigerate the tsuyu. Quick and easy version: Buy a bottle of concentrated tsuyu or mentsuyu, such as this one from Kikkoman, and thin out with water. 400g soba noodles, or about 100 grams per person (See note below about selecting soba noodles). Most soba comes in 100 or 200 gram packets. Bring a large pot of water up to a boil. Unlike Italian pasta, you do not need to salt the water. Once it's boiling, hold the noodles over the water and sprinkle them in strand by strand. Once all the noodles are in, stir gently so that they are all immersed in the water. Bring the water back up to a gentle boil, then lower the heat so that the water is just simmering. (This differs from the 'rolling boil' that's recommended for pasta.) If the water threatens to boil over, add about 1/2 cup of cold water (but if you lower the heat to the gentle simmer, and have a big enough pot, this shouldn't be necessary). Cook for about 7 to 8 minutes, or following the package directions (for thinner noodles 5 to 6 minutes may be enough. Test by eating a strand - it should be cooked through, not al dente, but not mushy either). At this point, you may want to reserve some of the cooking water. This is called sobayu (そば湯), literally 'hot soba water', and many people like to add it to the remaining soba dipping sauce at the end of the meal to drink like soup! Drain the noodles into a colander. Immediately return them to the pot and fill the pot with cold water. When you're draining the hot water you may notice that it smells quite 'floury'. This is what you want to get totally rid of. If the noodles threaten to flood out over the pot, put the colander on the pot to hold the noodles down. Leave the water running for a while over the noodles. Once the water and the noodle are cool, start to 'wash' the noodles. Take handfuls and gently swish and rub them in the water. Your goal is to wash off any trace of starchiness or gumminess on the noodles. When you're done the water should run clear. Make ready a flat sieve - a bamboo one is ideal and looks pretty. (You can use a nice looking colander instead, but flat sieves like this aren't expensive - look in Asian markets.) Take a few strands of the noodles at a time. Loop the strands onto the sieve to make a nice little bundle. This is one portion. Allow for about 10-12 portions or so per person, if you're using individual sieves. Arrange each bundle separately, to allow for easy pickup with chopsticks. Fill each dipping bowl halfway with the cooled dipping sauce or soba tsuyu. To eat, each person puts in the condiments of their choice, take a portion of the soba, and dips it in the sauce briefly - then, immediately eats the soba. Don't let the noodle soak in the sauce or overload it with condiments, otherwise the delicate flavor of the soba will be overwhelmed. At the end of the meal, you can add some of the reserve sobayu to the rest of your sauce (see above) to finish your meal. 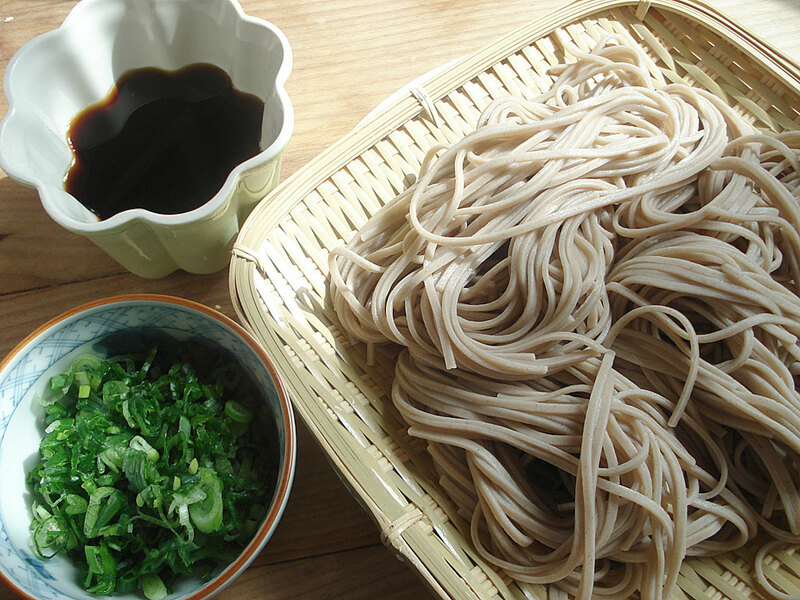 The purest kind of soba noodle is made of 100% soba or buckwheat flour, plus water and salt. That's really my favorite kind. There are other kinds of soba noodles though. Here I've used one made partly with konnyaku powder (which makes it quite sturdy, and supposedly lower-calorie). Another popular kind of soba noodle has some green tea powder in it, which makes it a pleasant green in color. You don't really taste the tea much though. One of my favorite summer meals is cold soba, cold tofu or hiyayakko_, some not-too-salty pickled cucumbers, and ice cold mugicha to drink. Another favorite soba accompaniment is tempura, which can be dipped in the same sauce - for some reason _tempura (battered fritters of vegetables, squid, shrimp and so on) seems to fit particularly well. But tempura is a rather hot and sweaty thing to make, so I usually stick to the cold tofu. Submitted by maki on 2009-06-30 18:06. Thanks for this post and the post on how to make kaeshi! I first had cold soba for breakfast on a flight from Tokyo to Honolulu many years ago, and it was a wonderful meal. I now keep soba noodles on hand just so that I can enjoy this dish. And how I wish I read this the first time I tried making zaru soba. The first time I made it was icky since I didn't wash it. It was a good thing someone told me to do so next time which I did, otherwise, I would've set it aside as something to never eat again. Cold soba is my favorite dish of summer besides cold somen! I also must have green onions with mine. Sometimes I'll slice a little komoboko (fish cake) to go on the side. My grandpa used to make us somen all the time. It's a bit of a comfort food for me. Delicious! So simple, but also so delicious. Growing up, we used to only have zaru soba about once a year when soba was still hard to find, so it was a real treat. Do you drink the tea? or whatever it is of the leftover men tsuyu mixed with some of the hot starchy cooking water afterwards? Maybe it was just to avoid wasting the tsuyu, but it is pretty good as long as you don't have too much tsuyu. Thanks for this post - it's wonderfully in-depth and has me searching my kitchen cabinets for soba noodles, kaeshi, and dashi! Thank you! I'd totally forgotten about this dish. Have a major craving for it now and am unfortunately unable to find buckwheat noodles. Sigh. I really love your blog, have known it for some years already. I miss Japanese food from Japan, restaurants in Spain tend to have just sushi, yakitori and a few more things and some of them don't tast as good as in Japan, so I end up cooking them at home from time to time. So it end ups being boring and expensive to go to them. I miss kateiryouri restaurants, izakayas and gyudon specially. Today I just happened to make zaru soba and I came across your recipe just after eating mine. I handmade my tsuyu too and it was quite good. I'll have to try yours! By the way, Maki, I'm obsessed with Hayashi rice but cannot seem to find any recipe with 100% home-made ingredients. I don't know if that's possible or if you must buy ru or mix ketchup and weircester sauce instead. Do you know of any good recipe for hayashi rice? Hi Helena! Hayashi rice is something I have been meaning to post here for some time but I haven't gotten around to it yet...and now that we finally have real summer here in Switzerland it doesn't seem to fit the weather at the moment! Briefly though, hayashi rice is a beef stew (using demi glace or a rich beef stock) with added tomato (in the form of puree or ketchup or both), a bit of worcestershire sauce, bit of soy sauce. It also needs tons of sliced and sauteed onions, and the beef should be thinly sliced. And it's thickened with a roux. Maybe that can get you going in the right direction? How long will the tsuyu keep for in the fridge? If you have tsuyu that's been in the fridge for some time, bring it to a boil first before using it...but sniff it first; if it smells even a bit sour or 'off' then toss it. A sushi bar my family orders from often has recently added this to their menu, since it's been getting so hot out lately (served as a "summer special" with inari nigiri), and I'm looking forward to trying it now after reading this! I just made this and the agedashi tofu--it tasted SOOO good and my boyfriend agrees, too! I'm never ordering these items at a restaurant again! Thank you for sharing your recipes! I have been struggling with gummy 100% buckwheat soba for ages. Thank you so much! Don't drain all the B vitamins! Lots of the nutrients in soba are water soluble, so the water it is cooked in is high in B vitamins. I suggest collecting some of it (put a bowl under the colander) and keeping it aside. In a Japanese soba shop it is called Soba-yu - you can ask for it at the end of your meal and it is typically brought in a square red teapot. Add some (best if it7s still warm) to what is left of your dipping sauce and drink it like a soup (very nice!). Or you can add some to a miso soup. Whilst I love soba and enjoy it prepared just as in your recipe, I'd never found a satisfying vegan way to enjoy these noodles I could share with friends. Hope you don't mind me sharing this here. I came across a recipe for bibim-guksu in http://mykoreankitchen.com using Japanese style soba recently. It's great as it is, but I modified it slightly and really enjoy this alternative way of enjoying cold soba. Re: Don't drain all the B vitamins! For a vegan alternative please don't use honey, but for a vegetarian one, carry on. My understanding is that some vegans will eat honey, and that the vegan community is not unanimous on this point. Thanks for posting the recipe Loretta! I love kochujan/gochujang. I agree about the soba-yu, though I reserve it only when it's from freshly made noodles or a soba-gaki (sort of a leaf-shaped soba dumpling) usually. I'm just curious if you can find soba noodles just in a regular super market, or are they located and sold strictly in Japanese markets/stores? I looked today at the grocer but did not find them! It really depends on where you live. I have seen soba noodles sold at regular supermarkets in some parts of the US for example, and they are sold in the 'gourmet' section of department stores here. Otherwise health food stores sometimes carry them. But Japanese grocery stores usually have the best selection. Some Asian (as in East Asian/Chinese) stores carry them too, if they carry Japanese ingredients. Here in Albany, New York, even the supermarkets carry a few soba noodles in the ethnic section. However, nowhere can I seem to find hachiwari soba, or even close. (I went to Japan briefly in 2007 and got totally spoiled by soba that actually tasted like buckwheat.) Even the big Asian grocery here, though it stocks a huge variety of soba, has wheat as the first ingredient on all of them. The natural foods co-op has 100% buckwheat soba noodles in the bulk section, but they're something like $22/pound. Grrr. I am basically Indian but love Japanese food and have tried my hand at some recipes from your site...particularly the hiyashi soba. - which was a 大ヒット at my home :) thanks to you! But I have always wondered about the usage of mirin and osake in making Japanese food. I have a 1 year old and so while making anything I am a little particular about what goes in. Is mirin/sake or any alcohol safe for usage in food which is for consumption for kids ? I do understand your concern! Like using wine in cooking, most of the alcohol content in mirin and sake dissipate when heated. But if you want to avoid any alcohol at all in soba sauce or any dish, you can omit it. You may want to compensate by adding just a little bit of sugar or other sweetener (especially when you omit mirin, which is quite sweet), and making sure that the dashi stock is very flavorful. Please keep on posting great recipes. I like this website a lot - the detailed descriptions are really helpful and its informative and entertaining too. That's sort of a myth. It can take hours for alcohol to evaporate in cooking. See http://www.ochef.com/165.htm . I love this dish, but it is messy. drip drip drip. I love zaru soba but I worry about the amount of sodium in soy sauce. Has anyone tried to use low sodium soy sauce in tsuyu and how does it effect the flavor? I live in Melbourne - Australia and there are a couple of Asian grocery stores that sell japanese soba noodles. Can you tell me which brand to buy if I'm looking for soba noodles that are made from 100% buckwheat flour? Otherwise, the closest to that ratio? It's hard to say since I don't know what brands are distributed to Australia. Nisshin (which is a very widely sold brand) does make one which is 100% soba - see pic here. They do sell several other types of soba though so you have to make sure what you are getting. Otherwise, just look at the ingredients listing, which should tell you all you need to know. BTW, your blog is amazing.. Looking forward to more entries from you! Hi there, I found this in my local asian market but all the instructions are in Japanese! How much do you dilute it? And what other uses are there for this tsuyu? Mentsuyu is basically a pre-prepared concentrate of the ingredients in the kaeshi plus dashi stock. (It's similar to Japanese Essence, a recipe I posted some time ago, which I used to use all the time though recently haven't much actually.) For cold soba, mentsuyu is usually diluted by 3x (so you mix 1 part mentsuyu to 3 parts water), but really the best way is to just dilute it to your taste. Some people like it more diluted, some less. Remember that the dipping sauce is just that, used for dipping, so it should be quite concentrated - and it will get thinner as you dip more noodles in it (from the moisture clinging onto the noodles). Mentsuyu is used for hot noodle soup, diluted more (4x or 5x), and can be used as-is instead of soy sauce in all kinds of cooking, or as a sauce for boiled vegetables and so on. hi, i just bought udon tsuyu in bottle form. how do i use it to make udon soup? do i need to add water? what is the ratio? same for soba tsuyu... thanks. This is an excellent blog. Have you even tried to write and publish an cookbook? I find your detailed knowledge of the cuisine and also your attention to detail when you explain so very impressive, since a lot of cooknooks and blogs take a lot of prior knowledge for granted. Huh? Did you click on the links, which lead you to detailed articles on what each item is? oishii-so deshu! I love zaru-soba but mine always turn out to be a bit of a clumpy mess. Will definitely give this method a go. Thank you so much for sharing this recipe! Your instructions were clear and simple to follow. I made it for a Japanese potluck party and it was a hit! The home-made tsuyu was definitely a thumbs up by few of my Japanese friends. Thanks so much for this! I just visited Japan and had no idea how to go about making the dipping sauce for soba noodles which was one of the best dishes I had there! Thanks AGAIN for the vegan version. Thanks for refreshing this one, I saw a package of soba noodles sitting in my pasta box the other day and thoought" wow, as hot as it's been I should try those!" I'm wondering if maybe shallots would be a good substitute for myouga? They were on sale here the other day and I bought some with no real plans for them, I'm thinking now hmm...maybe soba topping! Shallots could be interesting...though to me they have a slight garlicky-overtone which doesn't quite fit, but hey - it may work! I LOVE cold soba noodles! The sushi restaurant we go to used to serve them regularly but they've taken them off the menu and now only serve them hot as soup. I haven't cooked them for ages but as I have some in the cupboard, I feel the need to make them again! HI, why is it that the soba that I cook is not as soft and springy as those serve in the restaurant. My is always a bit hard and taste like wheat powder even though I cook it for more than 8 mins. You may just have a different kind of soba noodles, or you may have old noodles that are past their best-by date. If they taste floury, I suspect the latter. I tried your recipe this weekend and it was a HUGE hit with both my Caucasian husband and Japanese-American mother. What a difference washing the soba made! The texture and flavor were much better, and the dipping sauce was perfect. We used finely diced green onions and fresh grated ginger as a garnish. Both added simple, bright flavor. A while ago, before I learned about the need to wash the noodles, I bought 100% buckwheat noodles (hard to find in AL). The texture and flavor were so different from what we usually buy (the mix of buckwheat flour and regular flour) that my mother actually threw them out! Does the washing step make an even bigger difference with 100% buckwheat noodles? Might we have ruined them by not washing them? 100% soba noodles are not as stretchy as the usual type, which are usually 80% soba/buckwheat, 20% wheat flour. So they are a bit crumbly; some people love the more pronounced soba flavor, but others don't like the texture. Next time try cooking them for less time, and in plenty of water - a higher water to noodle ratio than usual. You do need to rinse well but not any more really than for regular soba noodles. Thanks, Maki. Love your blog. It's one of the best sources I've found online for Japanese cooking. Liked your blog. Even slurping soba noodles is part of the whole ritual of experiencing this simple food with all senses. Tried making this for the first time today and absolutely LOVED it! Perfect for a warm day. Thanks for the step by step instructions, they were so easy to follow. We even saved the water from the soba and used the left over dipping sauce to make the soup. Delicious!!! Thank you for the tutorial on how to make these but I do have a question. If I ended up with leftovers can I freeze them? Or will it change the texture? I wouldn't freeze leftover soba noodles...they'd turn quite mushy. The sauce can be frozen though. I try to make just enough or a bit more, and have the leftovers the next day. I made cold soba noodles for the 1st time and I really enjoyed it! I can tell why the japanese love it during the summer. Although, I've wondered why the recipe calls for so much noodles. I looked up other recipes and they all called for the same amount. I didn't have that much, and it looked like way to much for just 2 people; so I just used about 200g of the noodles. After that, we still saved half of it for the next day. The tsuyu reminded me and my dad of miso soup. It might be because of the dashi, or maybe because we bought it pre-made from the store. But after I added the sobayu to the tsuyu I just drinked it like a regular soup. I first tried soba after finding an instant package of it in a specialty foods shop, remembering reading this blog entry a while ago, and taking note of the unbearable heat here, I bought it and absolutely loved it! Going back to the store for another package, I picked up a package of dry soba noodles as well, as well as a cheaper package from a supermarket downtown. The price of the first was nearly three times as much, but had a -lot- more protein, fiber, calories and other nutrients listed (the size was slightly bigger as well, though these were based off of 100g and the labels)... is this because of the percentage of buckwheat flour used? My favorite quick place to eat in Narita Airport serves cold soba noodles with a sesame dipping sauce. Any ideas how to make this type of sauce? It's a thicker whitish sauce (assuming white sesame seeds, sugar, and?). You explanations are soooooo helpful for Westerners who wouldn't know the ingredients and how to handle them. We tried that recipe last night and we loved it. Thank you. You are blue sooo am i!! My baby is blue soo am i!! I have a question. Are 100% buckwheat soba gluten-free--the noodles themselves? I've been wanting to know if I could make modified versions of these. Thanks much for the detailed method on cooking and washing the soba noodles. I have cooked these noodles many times for my toddler using the instructions on the package (though washing the noodles was omitted from these instructions). Washing them made a huge difference in their taste and prevented them from tangling up. ,,also soba is great for not having a hangover, i used to work on ships from Japan, of course we would go out drinking beer ,sake,, scotch etc, but always get soba @ the end of the nite. i was told the buckwheat helps detoxify the liver and has many vitamins the alcohol uses in your body to process it. i make them all the time hot or cold and w/tempura shrimp or veggies it is great!! Thank you for this little article. I made an American beef and broccoli stir-fry recipe and the noodle rinsing step was omitted. The noodles formed a big mass by the time I was told to add them to the stir fry and while it still tasted good, the texture was not right. I just did a repeat of the recipe using chicken and rinsing the soba the way you described and it is MUCH better. I even think I will be trying some cold soba this summer for dinner. I have sometimes substituted very finely sliced onion for the green onion - it seems to work well in a pinch. Also, I often slice a rolled omelet/crepe as a garnish... You can find everything you need for this dish at one of the several online asian grocers - they ship very quickly. This is great, thanks so much!!! How far in advance can I make the soba, before serving? Thank you a lot for the tips. I usualy ate the salt the soba water to make theme taste better, but now I see why they were tasting like cold oathmeal gruel. so tonight's soba should,and will taste better. much better. I was wondering (I know this is an old post and not sure if you will read this) if there is an alternate noodle that could be used. I had this once at a Japanese restaurant; it was soooooo tasty! But shortly thereafter, I had to go to the hospital, I had a burning in my chest that was making me cry and it was hard to breathe. Turns out, I'm allergic to buckwheat! I was sad because I liked the dish very much. If you are okay with wheat flour, you can use somen noodles (very thin), hiyamugi noodles (thin) or udon noodles (thick to very thick) with the same dipping sauce and condiments. thanks for this great post. so many interesting things to do with the buckwheat soba noodles. i found your site thru google, was trying to figure out why my 100% buckwheat soba thickened my chicken broth almost to a stew-like consistency - now i know i was supposed to rinse the noodles and had no idea - the eden brand package had no mention of this step. thank you so much for sharing this information with all of us. next time i will know better. Just came across this while clicking random links... I know you shouldn't allow the soba to soak in the sauce, but I actually will mix the soba with sauce(a little bit... to the point where you can see the stains of sauce on the noodles, but the sauce has settled and covers just the bottom of the bowl) and bring this to work. It tastes great after sitting in the fridge, and the a/c at my job is terrible so this is quite refreshing. I'm so interested in making this dish and I went to an oriental supermarket in my city to get all the ingredients today! The only problem is that I don't have a zaru and I was wondering what I should serve the soba on instead, like a lightly oiled plate. I'd be afraid to put straight on un-oiled plate because they might stick , but I'm not sure. Any suggestions? Thank so much for posting amazing recipes. great article. I made the dish today and found it very similar to what I had in japan. but i have one question. if you make to many soba noodles, how do you store them? i'm sure they will get hard if you don't have water, but on the other hand, wont leaving them in water make them too soggy after a couple days? I've added a link to this article in my blog about cold noodles for kids and families to enjoy (especially those that don't eat meat) I love all of your step by step pictures and details, thanks for taking the time to do such an excellent post. After many repeat visits to Cocoran Soba noodles we are ready to start preparing soba noodles at home. Found your site and am loving this article. Thank you. Thanks for the detailed instructions for cooking soba noodles. Because of them, my first attempt didn't turn into a glutinous mess. I used the soba with a wasabi shrimp carbonara sauce and the result was pretty tasty. I tried the sobayu, but since I didn't have tsuyu, I made do with a bit of teriyaki sauce. It was surprisingly refreshing! I just made this for the first time and it was the most satisfying meal I've had for the whole summer so far. I'm pretty sure I broke the rule about not overloading the sauce with condiments as I put quite a lot of grated fresh ginger in there. But I'm not sorry, because it gave the dish the most WONDERFUL gingery buzz. The spring onions also did their part. I couldn't stop sipping the sauce (undiluted, as I forgot to save the sobayu) after I was out of noodles. This is definitely going in my repertoire of summer food. I googled 'soba noodle' recipes for a minor craving I have and found your website. I'm somewhat obsessed with Japanese cooking/food and will enjoy making your delicious recipes. I live in San Diego, CA and am fortunate to have an array of wonderful Japanese markets to choose from. Thank you for providing culinary inspiration to my less-than-perfect Japanese cooking skills. Hi, I found your page by Googling soba noodles recipes. I'd just like to offer an alternative way to cook the soba noodles for people with very little time. This only applies to dried soba noodles. 1) You'll need a microwaveable bowl large enough to fully immerse the noodles. 2) Half-fill the bowl with BOILING hot water. Slowly immerse the noodles in the water and pour hot water over the remaining bits of noodles still sticking out. Give it a quick stir to loosen the noodles and stop them from sticking together. 3) For a 1000W microwave, set it to full power for 2 1/2 minutes. Check the noodles to see if they are sufficiently softened. If they are not then just cook for another 20-30 seconds. When it's done, give it another stir to loosen the noodles. It really pisses me off how people are saying they can't find a place that sells soba noodles. I see this everywhere in any kind of recipe....."I can't find this, can I replace it with spaghetti?" Ask your asian friend where the nearest hong kong super market is idiot! Ohh, I love soba, thank you for posting this! Thx for sharing the recipe. Just wondering how to serve cold soba? Is it after boiling and rinsing the soba in running cold water, putting them in refigerator? I'm afraid the soba will be stick and lumpy. Thank you so much for all these wonderful posts! Having just begun a tentative attempt at blogging, I'm beginning to realise the dedication required to keep it up. Hats off to you and your recipes! Anyway, I'm not sure about blogging etiquette, but would it be alright to post a link to this post (and also the one on making udon)? I just had some really good udon that has reminded me of an age-old intention of prepping up a batch of kaeshi, and this is a great place to direct people to. Where can you find/what brand are the buckwheat konnyaku noodles? When was in Japan I would often have this during summer, now I am back home in the UK I tried recreating this. It turned out horrible, not due to the sauce but the type of soba noodles I used. I used itsuki inaka countryside buckwheat soba noodles, the taste was far too strong for my liking and the noodles were very thick. When I was in Japan they were using whitish coloured noodles which were very thin and subtle tasting, any idea what they would be? As I couldn't stand these soba noodles. Are you sure you had soba and not somen noodles in Japan? Somen noodles are very thin, white and made of wheat only. 'Inaka' anything means 'country style' so it's going to be rustic, like a whole grain bread. You may want to try a noodle that just says 'soba' and no inaka etc. Or, maybe try somen instead. And be sure to rinse the noodles very well in either case. Hi, thanks for your recipe and detailed instructions. I used to make my own following the instructions on the packaging but they never tasted like in the restaurant. The ones served in our restaurants are using very cold and chewy. I must try using your instructions again. Can I asked if the cold water you used for washing the noodles is just cold tap water? Do you place the noodle into the refrigerator after washing? Yep it's just cold tap water, and no I don't refrigerate the noodles. If you want to server them very cold, you can put some ice cubes on them (with a plate under the flat sieve to catch the drips). This is not done much with soba noodles but is done with somen and hiyamugi, other types of noodles served cold. How do they traditionally make the flour that they make soba with? I live in the land of buckwheat, and would love to learn this secret.. so far, the coffee grinder technique is not getting the fine powder I would love. It appeared as a 404 Page Not Found notice instead. Thanks for writing this article! It's good to have common mistakes clarified nicely, like the washing VS plunging one. I have a co-worker who lives in Cleveland buy fresh soba for me from Ohio City Pasta at Cleveland's West End Market. This is quite a treat and is so much better (personal preference) than dry soba noodles. I also make my own kaeshi and dashi to get the pure flavors and no MSG. A local Japanese supermarket here in Columbus Ohio has 100% buckwheat soba which I buy because I am gluten-sensitive. Maki, thanks for posting your kaeshi and zarusoba tsuyu recipes. I have been using these since I found them a few years ago. I love Japanese food and I love your web site!